KANNAPOLIS, North Carolina (April 1, 2019) – Aric Almirola, driver of the No. 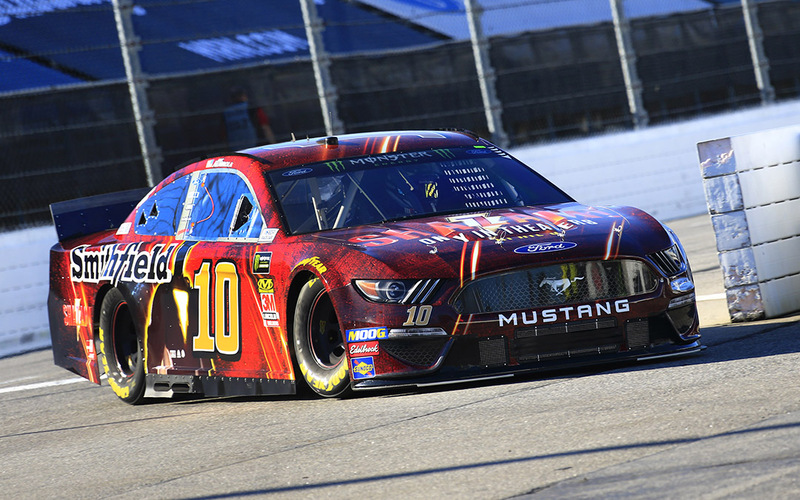 10 SHAZAM!/Smithfield Ford Mustang for Stewart-Haas Racing (SHR), makes his second short-track start of the season this weekend at Bristol (Tenn.) Motor Speedway. After finishing seventh last weekend at Texas Motor Speedway in Fort Worth, the No. 10 Ford team extended its streak of top-10 finishes to six and feels on the verge of a win this weekend at The Last Great Colosseum. ● Aric Almirola will make his 288th career Monster Energy NASCAR Cup Series start Sunday at Bristol (Tenn.) Motor Speedway. ● Career: Almirola has career totals of two wins, two poles, 16 top-five finishes, 55 top-10s and 429 laps led in 287 starts. ● 2019: Almirola has earned one pole, one top-five finish, six top-10s and has led 72 laps in seven races this season. ● In Almirola’s three NASCAR Gander Outdoors Truck Series starts at “The Last Great Colosseum,” he finished second, sixth and 32nd, the latter due to an accident. ● The Smithfield driver has seven NASCAR Xfinity Series starts at Bristol with one top-five finishes and four top-10s. ● Last win: His most recent Cup Series win came Oct. 14, 2018 at Talladega (Ala.) Superspeedway. ● Point standings: Almirola is fifth in the Monster Energy NASCAR Cup Series standings with 245 points – 65 out of first place. ● Last race: Almirola’s seventh-place finish at Texas Motor Speedway in Fort Worth last weekend was his career-best sixth consecutive top-10 of the season. ● SHAZAM! : The new DC Comics by Warner Bros. movie SHAZAM!, starring Zachary Levine, is based on a streetwise 14-year-old who can magically transform into the adult superhero Shazam simply by shouting out one word. His newfound powers soon get put to the test when he squares off against the evil Dr. Thaddeus Sivana. Almirola and his No. 10 Ford Mustang will sport a paint scheme featuring the movie this weekend at Bristol.